Of the many colorful characters who have become legends of the Old West, "Hanging Judge Roy Bean," who held court sessions in his saloon along the Rio Grande River in a desolate stretch of the Chihuahuan Desert of West Texas, remains one of the more fascinating. According to the myth, Roy Bean named his saloon and town after the love of his life, Lily Langtry, a British actress he'd never met. Calling himself the "Law West of the Pecos," he is reputed to have kept a pet bear in his courtroom and sentenced dozens to the gallows, saying "Hang 'em first, try 'em later." Like most such legends, separating fact from fiction is not always so easy. 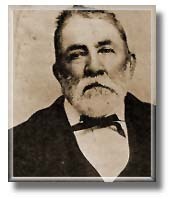 Roy Bean was born in Mason County, Kentucky about 1825. At age 15 he left home to follow two older brothers west seeking adventure. With Brother Sam, he joined a wagon train into New Mexico, then crossed the Rio Grande and set up a trading post in Chihuahua, Mexico. After killing a local hombre, Roy fled to California, to stay with his brother Joshua, who would soon become the first mayor of San Diego. There, Roy developed a reputation for bragging, dueling and gambling on cockfights. Mayor Josh Bean appointed Roy a lieutenant in the state militia and bartender of the Headquarters, his own saloon. In 1852, Roy was arrested after wounding a man in a duel. He escaped, and after Mayor Josh was killed a few months later by a rival in a romantic triangle, Roy headed back to New Mexico where brother Sam Bean had become a sheriff. Roy tended bar in Sam's saloon for several years while smuggling guns from Mexico through the Union blockade during the Civil War. Afterward, he married a Mexican teenager and settled in San Antonio, where throughout the 1870s, he supported 5 children by peddling stolen firewood and selling watered-down milk. His notorious business practices eventually earned his San Antonio neighborhood the nickname Beanville. In 1882, the Galveston, Harrisburg and San Antonio Railroad hired crews to link San Antonio with El Paso, Texas across 530 miles of scorching Chihuahuan Desert, infested with bobcats, rattlesnakes and scorpions (locally called vinegaroons by local Texans). Fleeing his marriage and illegal businesses in San Antonio, Roy headed to Vinegaroon to become a saloonkeeper, serving railroad workers whiskey from a tent. As his own best customer, he was often drunk and disorderly. But with the nearest courtroom a week's ride away, County Commissioners were eager to establish some sort of local law enforcement. They appointed Roy Bean Justice of the Peace for Precinct No. 6, Pecos County, Texas. Roy was just crazy, or drunk enough to accept. He packed up and moved north from Vinegaroon to a small tent city on a bluff above the Rio Grande named Langtry in honor of a railroad boss who had run the Southern Pacific's tracks through it. The name also happened to belong to a beautiful British actress, Lillie Langtry Roy had read about and become enchanted with. Roy built a small saloon and named it the Jersey Lilly (Lillie's moniker) which also served as his home. He hung a tattered picture of Miss Lillie behind the bar, and above the door, posted signs proclaiming "ICE COLD BEER" and "LAW WEST OF THE PECOS." From here Roy Bean began dispensing liquor, justice and various tall tales, including that he himself had named the town for actress Lillie Langtry. Roy Bean's justice was not complicated by legalities; it was characterized by greed, prejudice, a little common sense and lots of colorful language. "It is the judgment of this court that you are hereby tried and convicted of illegally and unlawfully committing certain grave offenses against the peace and dignity of the State of Texas, particularly in my bailiwick," was a typical Bean ruling. "I fine you two dollars; then get the hell out of here and never show yourself in this court again. That's my rulin'." One of Bean's most outrageous rulings occurred when an Irishman was accused of killing a Chinese worker. Friends of the accused threatened to destroy the Jersey Lilly if he was found guilty. Court in session, Bean browsed through his law book, turning page after page, searching for another legal precedent. Finally, rapping his pistol on the bar, he proclaimed, "Gentlemen, I find the law very explicit on murdering your fellow man, but there's nothing here about killing a Chinaman. Case dismissed." In legend, Judge Roy Bean is a merciless dispenser of justice, often called "The Hangin' Judge." But that title goes to Isaac Parker of Fort Smith, Arkansas, who sentenced 172 men to hang and actually strung up 88 of them. In his book "Judge Roy Bean Country," Jack Skiles says that although Bean threatened to hang hundreds, "there's no evidence to suggest that Judge Roy Bean ever hung anybody." One or two were sentenced and taken to the gallows, but allowed to escape. Despite his self-serving antics, Roy was duly elected to the office in 1884 and often reelected, so that between 1882 and 1902, most of Roy's bizarre rulings were the law. Except for an occasional murder, his cases consisted mostly of misdemeanor counts of drunkenness and the crimes of smalltime con men like himself. Roy spent most of his days sitting on the porch of his saloon, with rifle handy. In his spare time, he served customers. His favorites were railroad passengers, desperate for something to drink while the train took on water. Bean served them quickly, then lingered before giving them their change. When the train's warning whistle blew, customers swore and demanded their change. Roy then fined them the exact amount and sent them cursing back to their railroad cars. In 1898, prizefighting had become illegal in most Western states, as it was in Mexico, and promoters could find nowhere to hold the world championship title bout between Bob Fitzsimmons and Peter Maher. On February 22, the Jersey Lilly was packed with 200 fight fans who, after a few rounds of drinks, followed Roy to a bridge he built to a sand bar in the Rio Grande River. While Texas Rangers watched the makeshift ring helplessly from atop the bluff, Fitzsimmons decked Maher in only 95 seconds. After returning to the saloon for more drinks, the fans and sportswriters headed for El Paso, where news stories were filed to papers throughout the U.S. This event launched the birth of the Roy Bean legend, which burgeoned after continued newspaper and dime novel accounts of his exploits, many fabricated by Roy himself. The myth of Roy Bean eventually became part of Texas folklore. In 1936, the Texas Centennial Fairgrounds displayed replicas of Roy's saloon and office. In 1940, Walter Brennan received an academy award for his portrayal of Roy Bean opposite Gary Cooper. In 1956, Edgar Buchanan played him in a weekly TV series, and in the 1972, Paul Newman portrayed him in the movie, The Life and Times of Judge Roy Bean. For years, Roy boasted of his "acquaintance with Miss Langtry," and promised locals she would one day arrive and sing in Langtry. In 1896, after his first saloon was destroyed by fire, Roy rebuilt the Jersey Lilly and constructed a home for himself across the street, which he called the Opera House, anticipating the day when Lillie would perform there. Roy never met Miss Lillie, but he often wrote her, and she is purported to have written back, even sending him 2 pistols, which he cherished till his dying day. Contrary to the Larry McMurtry novel and movie Streets Of Laredo, Roy was not gunned down by a Mexican outlaw on the steps of the Jersey Lilly. In March 1903, Roy went on a drinking binge in Del Rio and simply died peacefully in his bed the following morning. Ten months later, the Southern Pacific stopped at Langtry and finally disgorged Lillie herself on the way from New Orleans to San Francisco. She had decided to take the judge up on his invitation. She visited the saloon and listened as locals told her how Roy Bean had fined a corpse, freed a murderer and lined his pockets by shortchanging train passengers. "It was a short visit," Lillie later wrote in her autobiography, "but an unforgettable one." These days, almost 100,000 sightseers visit Langtry each year. Tourists from all over the world arrive by car, train and tour bus, seeking the romance of the American West. "Where's your hangin' tree?" is their most common question. But from the steps of the Jersey Lily saloon, one can only see the remnants of an old mesquite tree, a dozen sad and dusty buildings and the hot, unforgiving Chihuahuan Desert all about. The nearest courtroom is in Del Rio, 50 miles away.